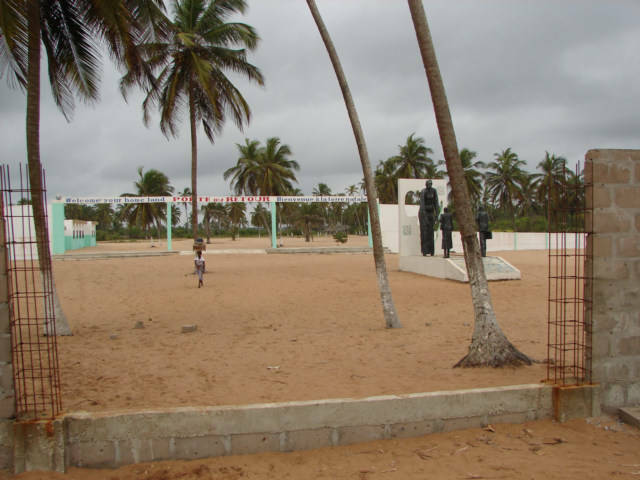 I went searching for Papas Hotel on the beach, about 12 Kilometers from Ouidah, an extremely tourist hotel, with prices to boot. Found about three hotels that would be better for me, just beyond the edge of the city in a way, on the way to the beach. I think the Panff is in the newer area, and I like to be in the older, more traditional areas. Then the door of return. 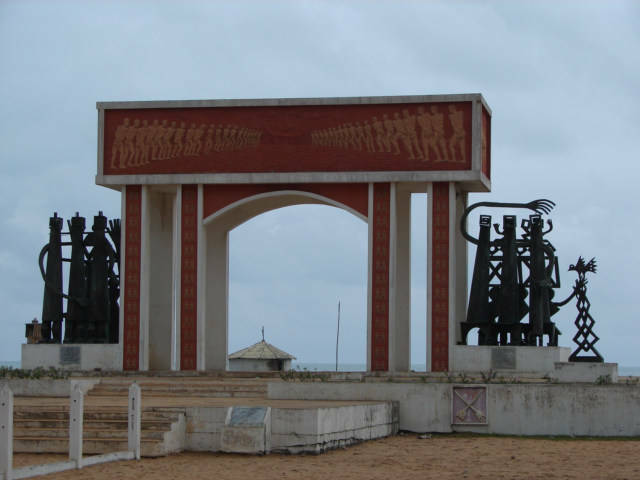 I understand that Elmina Ghana and Ouidah, Benin were two of the major areas of exportation of slaves. I am wondering about the big cavernous rooms in some of the forts, there is not fort here, no rooms. The need to store slaves until they shipped them out to the Americas is my question. There were routes for trade, carrying different products on all the different trips or legs of the journey. Ivory would take a long time to collect, need a different type of storage, gold for sure needs a fort. The mechanics of how they shipped the slaves to the Americas is a quandary to me. How long would a ship dock and stay docked at one of these ports? Did they come, then go collect the black people, did they just have a group of them sitting around waiting for any ship that passed to pick them up. Easy to believe by me would be that many of the chief capture other black people in other tribes they hated. They could just kill them, however they had value. Therefore, go out and collect a lot, trade for gunpowder and anything they wanted from the white men. Keep the people from the other tribes; use them as their personal slaves until they sold them. Chains, ropes, binding of future slaves for a long period of time would be lots of work, diminish the value of the product, destruction of the future product exportation. How to keep them safe, fed, and together, on the way to the beach is a big swam area, it is not just or was not just a walk to the beach from Ouidah, there we major puddles in the way. Ouidah is just the closest elevation that is significant, and I think some Fresh water by streams. Yes, there is this river running for a long way parallel to the ocean, however close to the ocean and not where Ouidah is located. I think Ouidah probably popped up after wells and farming became more common. It would seem logical that I could find out all this information here, however not normally the case. I need some good libraries in the USA or France maybe. There is a museum here, I think on Voodoo, maybe it has some information.